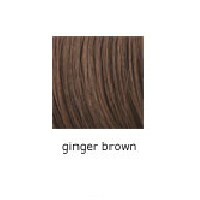 Hairdo 15 Inch Chestnut [R10] Wavy Clip-In Extension vy Jessica Simpson & Kern Paves for HAIRUWEAR. HairDoTM is available in both 100% fine human hair and Kanekalon Vibralite? modacrylic fiber, the finest quality synthetic fiber available. The collection is available in 21? long human hair and in four synthetic versions: long and mid-lengths in straight or softly waved textures. Affordable, lightweight and easy to attach, these virtually undetectable extensions can be put in and taken out in a matter of minutes. All HairDoTM Clip-in Extension Systems consist of one multi-level, contoured piece that creates an easy, fashionable style without the hassle of working with several individual wefts. Avenue You and aveyou.com is proud to present Jessica Simpson and Ken Paves HairDo clip-in extension system.